MPs who have withdrawn from the Lithuanian Social Democrat Party (LSDP), who have spoken of the creation of a new organisation, state that it will be done at "the politically most convenient time." The former social democrats who chose to disobey the LSDP council ruling last October to withdraw from the ruling coalition with the Lithuanian Farmer and Greens Union (LVŽS) and left the LSDP or were removed from it as a result, hinted at the creation of a new party in November. It should be called the same as the group uniting the "rebels" in Seimas – the Lithuanian Social Democrat Labour Party. It has been announced that the founding congress should be held at the end of October or early March this year, however the date of the new organisation's founding has not been announced yet. As MP Gediminas Kirkilas, who is held as being the informal leader of the to be founded party, told Delfi, the founding congress will likely be held in early March. "But we will do it [the congress] when it is politically beneficial to us. There are various dates that suit us. After all, no one is controlling us from Moscow – we do things whenever we wish," he said. G. Kirkilas explained to Delfi that in this process they would benefit most from employing a strategy used by Apple. "It is the anticipation for a new Apple device, which is talked about for half a year. It is always late, but it finally appears and everyone rushes to buy it," the "rebel" leader assured. When asked if this is an effort to spark intrigue, he responded that "Yes, certainly. That is politics. It is great that our future opponents are interested in us and appear to be worrying about it. Perhaps even fearing." The schism, which occurred in the LSDP, culminating in the party members' withdrawal in last autumn, has been influencing voter moods negatively. This is also revealed by a survey commissioned on November 10-19 by the LSDP Jonava branch from the public opinion and market research company Vilmorus, during which 1003 citizens were interviewed. 54.3% of respondents answered they did not know regarding the survey question of "Has the LSDP grown stronger or weaker with the withdrawal of 9 MPs?" However, 31.1% of respondents indicated they believed the Social Democrats were weakened. 14.6% of respondents indicated they believed the LSDP grew stronger due to this. Evaluating the results based on survey takers' political views (based on what party they would vote for), the withdrawal of part of the Social Democrats as a weakening factor was identified by 45.2% (56 individuals) of "Farmer" sympathisers who participated in the survey, 39.2% (31 individuals) of Social Democrat supporters and 31% (49 individuals) of Conservative voters. G. Kirkilas told Delfi that such results reflect the real situation. "Of course the Social Democrats were weakened. Firstly, the party's representation in the Seimas was weakened and in order to have its own parliamentary group, it has to rely on deserters. Secondly, the party ended up in the opposition without a motive together with the Conservatives and in essence now has to support decisions initiated by the latter. Thirdly, the number of individuals who can speak in public, communicate has decreased. This is fairly clear – parties always are weakened if they lose part of their former leaders," he stressed. LSDP chair Gintautas Paluckas assured that the withdrawal of famous names has a negative impact on the party, but on the other hand also grants added value. "Various intrigues which were prevalent for a long time, watching over one's shoulder, individual political actions also do not strengthen the microclimate in a political organisation. If there are irreconcilable positions, views of the party's prospects for development or strategy, every member, no matter if they are influential or important has the right to choose – to travel together and adapt or choose a different path," the LSDP chair said. During the January 27th LSDP party council, G. Paluckas spoke that the "rebels" are forming their new political entity unfairly, seeking to draw as many individuals as possible from the LSDP through manipulation. However, such efforts are apparently not yielding results. Meanwhile one of the new party's initiators Juozas Bernatonis tells Delfi that people "are not being lured." 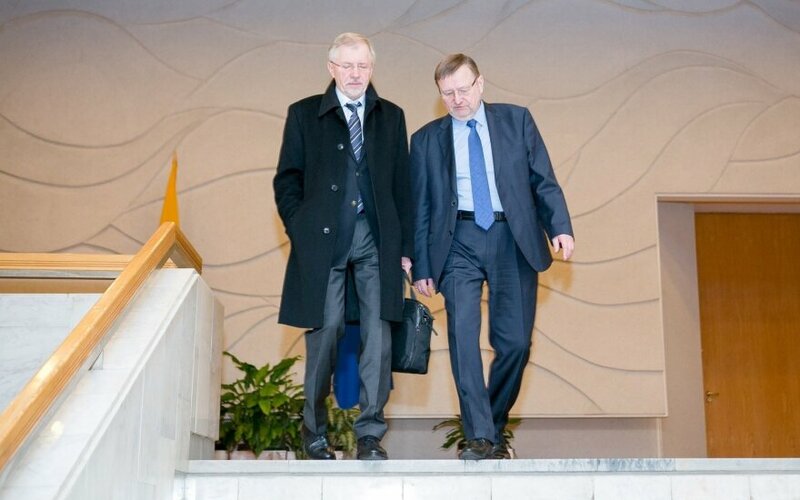 "We are simply making use of an opportunity – since G. Paluckas went to the radical left, this way the traditional social democrat field opened for creating a Scandinavian style classical social democrat party which, to our understanding, will have a niche in Lithuania, as it has had for 120 years," the politician explained. According to J. Bernatonis, representatives of various parties are taking interest in the new organisation's founding: social democrats, liberals, Labour Party and Order and Justice Party current members who are "discontent regarding something." He assured that the new party's creation was encouraged by the current LSDP chairman's position. The politicians who withdrew from the LSDP last October, who planned to continue working in the ruling majority, offered their former comrades, who left to the opposition, to continue working in the same Seimas group, however received the response that only social democrats can belong to the Social Democrat Seimas group. "I questioned what difference is there, we are social democrats in our views, they are social democrats with party tickets, we can work together. If the group had been retained, we would not have needed to create a new entity. However, G. Paluckas demanded that we would change our name. Since the group has two Labour members, we chose the name Social Democrat Labour Group, but did not think a fracture would occur," J. Bernatonis explained. According to him, when the break-up happened, the Social Labour members became a Seimas group with no party. "In the joint group we would have remained non-partisan, could have waited for 2020 [the LSDP precepts outline that members who withdraw or are removed from the party may request entry again in two years]. But I believe that this cleansing was done intentionally, out of a fear of competition," the politician stated. With talks spreading of the "rebels'" intentions to gather a new party, talks appeared that the politicians are prepared to make use of the opportunities provided by public election committees. To note, a start was given to committees intended for municipal elections during the 2015 mayor and council elections: at the time the committees obtained fourth position based on voter counts. Already back then there were talks that political parties stood behind certain committees and during the Seimas elections, committee members appeared in party electoral rolls. It has been observed that the Prienai public election committee "Už pasitikėjimą, atsakomybę ir sėkmę" received support from the then Social Democrat group prefect in Seimas Andrius Palionis of the Prienai party branch, who has since joined the "rebels." Currently the "rebels" who intend to form a new party have already formed entourages of now non-partisan mayors of various municipalities, who withdrew from the LSDP. Among them, we find Klaipėda region Mayor Vaclovas Dačkauskas, Rokiškis region municipality Mayor Antanas Vagonis, Druskininkai Mayor Ričardas Malinauskas and others. It has not been dismissed that they could become the leaders of public committees formed for the 2019 municipal elections. Especially when the future Social Democrat Labour Party's precepts include the notion of cooperation with public committees, something that J. Bernatonis confirmed to Delfi. "The statute outlined cooperation with public electoral committees which are created for municipal elections," he explained. When asked if this is not a plan to make use of the popularity of the public electoral committees, not identifiying their creators as members of the new party, J. Bernatonis responded, "It is difficult to say so. Certain mayors who left G. Paluckas' party have already declared they will form committees. This means they do not plan to join another party. Meanwhile we will of course seek to cooperate with everyone who supports our programme," J. Bernatonis explained. Vilnius University Institute of International Relations and Political Science (VU TSMPI) professor Tomas Janeliūnas believes that the public committees can be a potential force in the municipal elections – in some cases even more important participants than the parties themselves. "However in such a case [if the future "rebel" party would yield way to the committees during the municipal elections], the question would arise, what that party's face is and whether they will manage to form their image that way and prepare for the more important efforts," he mused. According to the expert, it is currently hard to understand whether the so-called "rebels" truly wish to create a new party. "At the very least such delays [moving back the potential founding date for the party] show that it is difficult for them. Even if they really wanted to, the fact that we do not see the beginnings of the party's founding shows that it may not be all the easy to gather it. Respectively, no one can guarantee when it will be created," he said. The political scientist mused that even if the new party was born, two very similar orientation political parties would likely struggle to fit in the same spectrum. "One way or another, only one of them would dominate. Of course, circumstances may develop differently and both parties could have representatives in Seimas, but the social democrat parties' niche is nevertheless more or less "reserved" for only a single party. The competition for the same name, the same political orientation would be very difficult and likely detrimental to them both," T. Janeliūnas noted. Meanwhile Mykolas Romeris University Political scientist Rima Urbonaitė mused that LSDP leaders also have cause for concern. "The social democrats must see those nuances differently when they open the newest party ratings. And those ratings are "successfully" continuing to fall. The party is increasingly entering some sort of shadow. Perhaps inside they feel like they are working and have ideas, but the reality is such that we see them increasingly less, no longer know what the real social democrats and where they are headed today," R. Urbonaitė observed. According to her, such a situation is an excellent environment for the "revels" to operate. "The LSDP certainly has no revolution or changes ongoing. And certainly disappointment may set in soon, something I predicted when G. Paluckas spoke of a brighter tomorrow for the party after the schism," the political scientist noted.